Mesmerizing treasures and contrasting atmospheres distinguish the sands of Egypt. Pyramids rise from the desert; camels cross epic dunes, turquoise waters lap against empty beaches while medieval masterpieces are scorched by red dust. 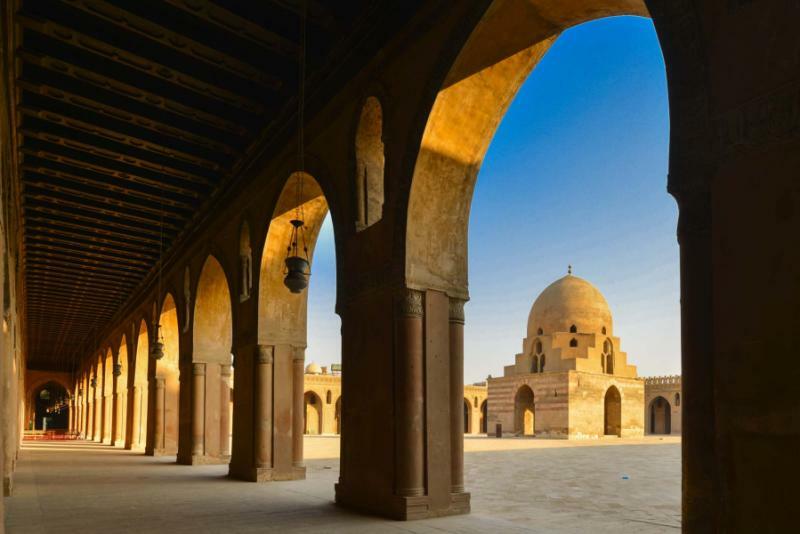 Connecting poignant destinations, this handcrafted 11-day tour celebrates the marvels of Egypt’s sands, from the delights of Giza and Cairo to the serene ambiance of the Red Sea and the surreal Sahara Desert. The sands of Egypt have always been home to greatness. Pyramids rise majestically, guarded by incomparable sentinels like the Sphinx of Giza. Camel trains continue to cross Saharan dunes, undertaking the same journeys generation after generation. Seductive treasures are uncovered in the Red Sea, beside waves that lap gently against a coastline of untouched sand and palms. All these sands have their unique atmosphere. Some destinations are to marvel at, the wonders of antiquity stretching high into the desert sky. Other sands are for adventure, camels, and ATVs taking you into a realm of solitude. 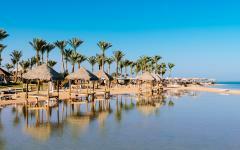 And six nights along the Red Sea’s sands are for getting away into the tranquility of the coast. This handcrafted itinerary connects the sands of Egypt. 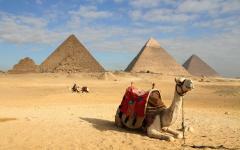 Start with four nights in Cairo, where your hotel rooftop overlooks the Great Pyramids of Giza. 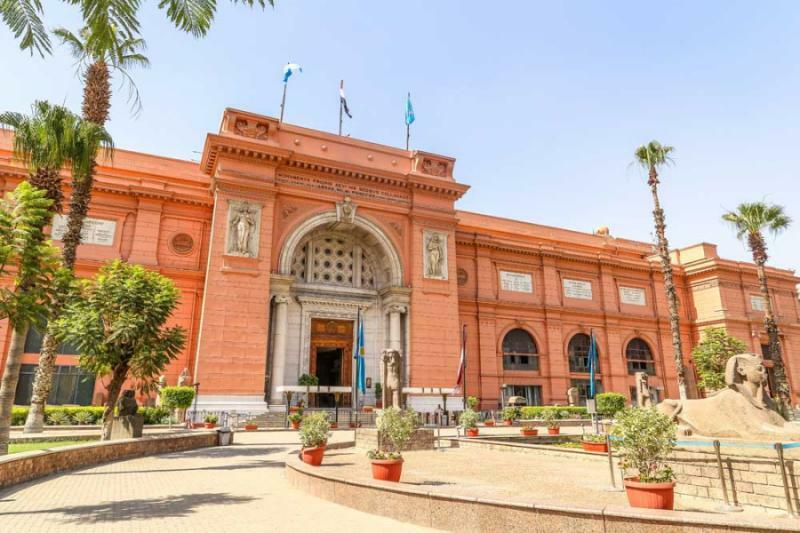 An Egyptologist guide leads you through the treasures of the Egyptian Museum of Antiquities along with ancient desert cities like Memphis and Saqqara. 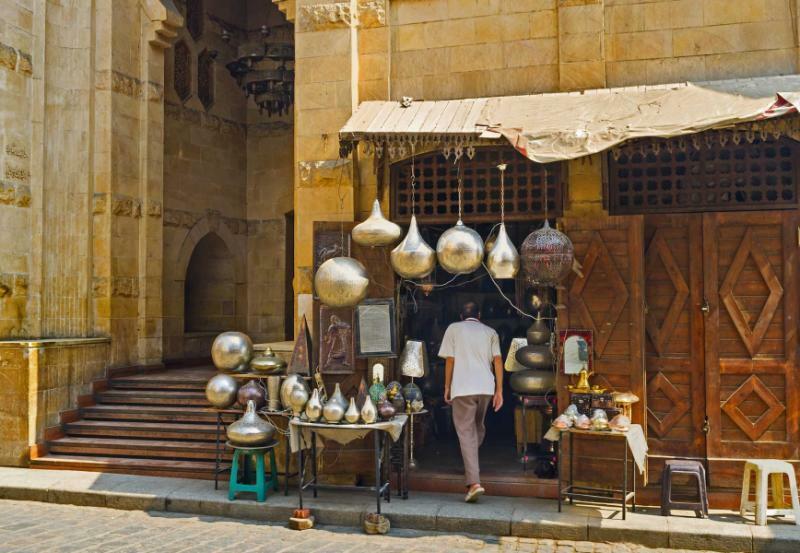 Spend a day exploring the vibrant atmosphere of Medieval Cairo, home to some of the world’s finest Islamic architectural treasures. 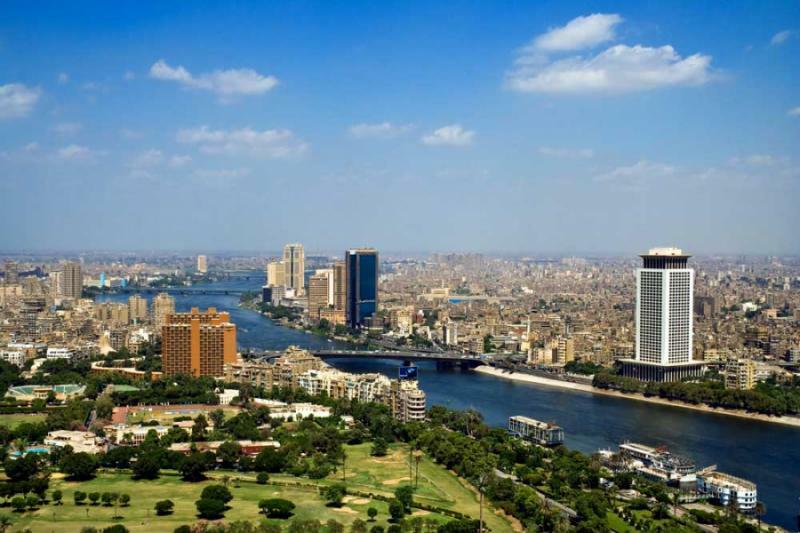 Cairo is the modern city in the desert and the four days will enable you to explore both its Pharaonic gems and contemporary style. Next, you fly south for six nights at a five-star resort in El Quseir. Spend days relaxing on the quiet beach, beneath the shade of desert palms. 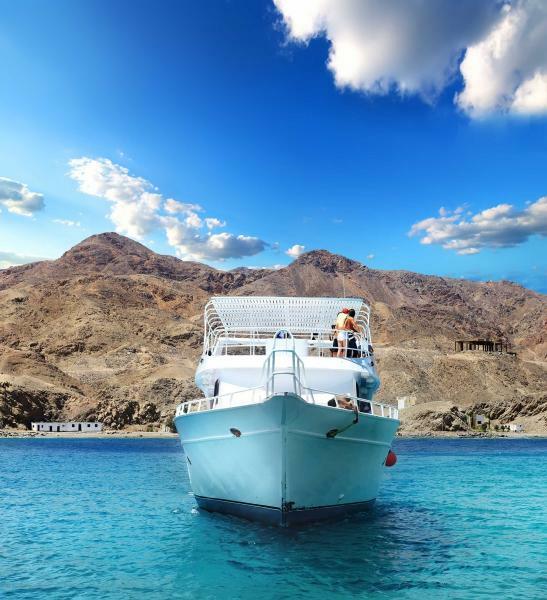 Exquisite snorkeling and dive sites can be found just a couple of miles offshore, beneath the turquoise facade of the Red Sea. 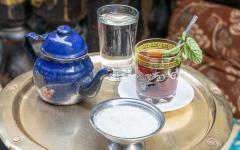 Travel inland and you’re immersed in the ambiance of the Sahara Desert. You’ll spend a day in the surreal dunes of Wadi El Gemal National Park, where the solitude and natural splendor will stay with you for decades. There’s also a day discovering Quseir Desert by camel and ATV, an inspiring journey that showcases how the sands of the desert meet the sands of the sea. 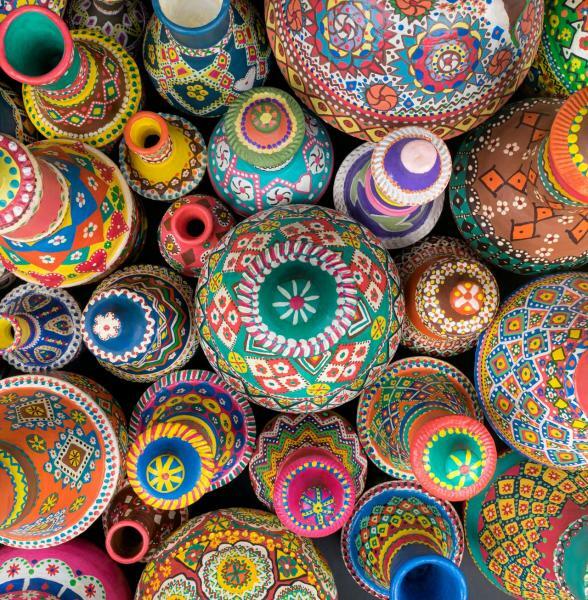 These 11 days provide a mesmeric journey through history, culture, and escapism. As the sands fuse together, you savor the tranquility that can be found everywhere from the desert to the beaches. 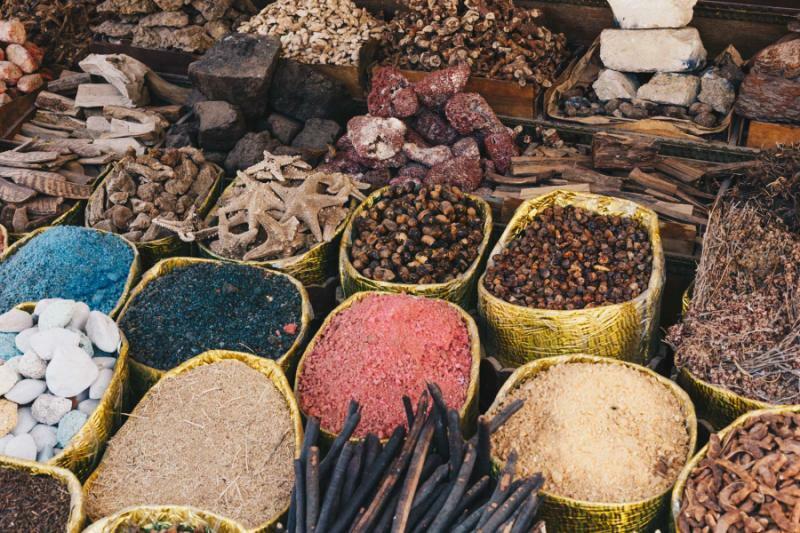 Along the way, there are plenty of hidden delights, from rooftop gardens to oases and the nomadic wanderers that crisscross through the desert. All tours are private, and you connect the city with the coast on a domestic flight. Cairo will impress you from many angles. A sense of history will ring out from city suburbs, where the architecture displays the centuries. You will find modern shopping malls and contemporary styles in the center, while affluence marks the tree-lined boulevards of Gezira Island. 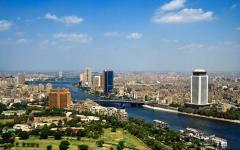 This is the redolent capital city in the desert as the metropolis rises from the sand alongside the River Nile. 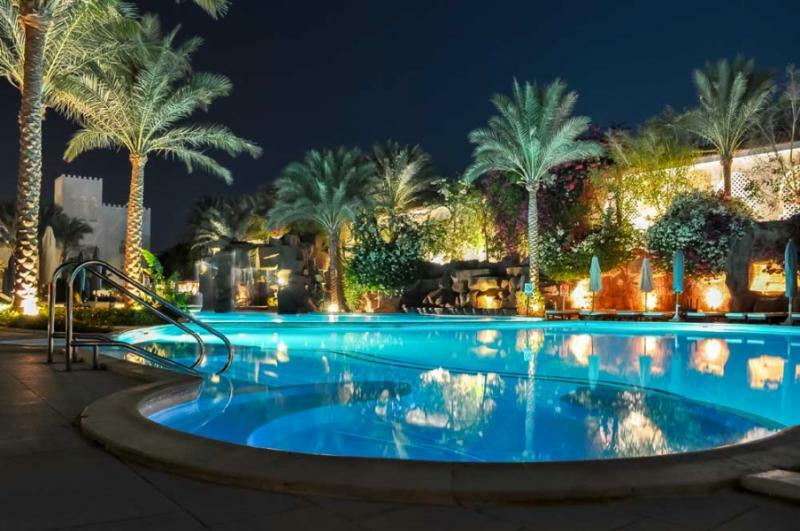 After your private driver meets you at the airport, you will transfer to Giza, a city suburb where desert sands continue to grace the landscape. You will marvel at the Great Pyramids of Giza that rise high above you as this ancient world wonder will be visible from the gardened rooftop of your five-star accommodations. Tomorrow you will inspect the details of the pyramids but today, you will sit back and admire the ancient skyline from your hotel. The evening will be at your leisure. The next morning, you will discover that staying next to the pyramids is the best way to beat the crowds. Exploring the complex is special at any time of day, but the experience will take on a new dimension when you are practically alone with these epic landmarks. 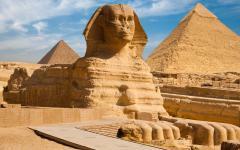 You will pass the Sphinx of Giza, the surreal sculpture that stands guard at the entrance to the complex. 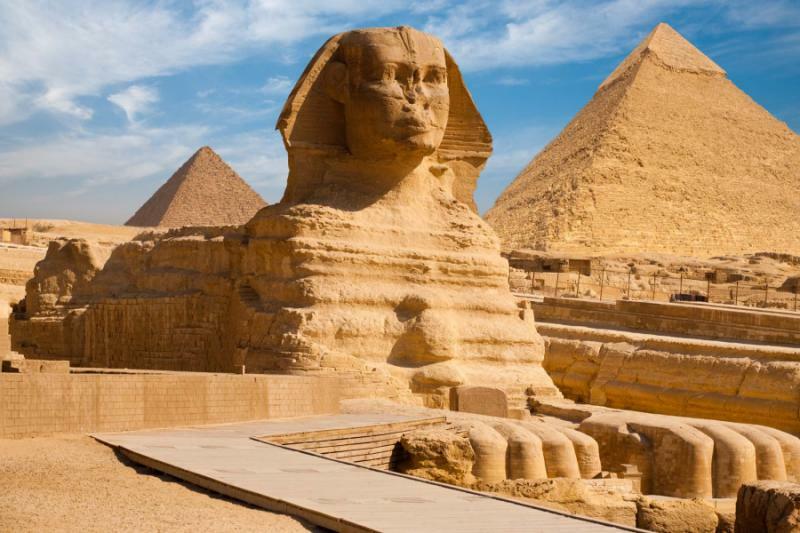 Then approach the pyramids as you will first take in the panorama of all the pyramids, then watch the dust spring up as you step closer to these stupendous monuments. 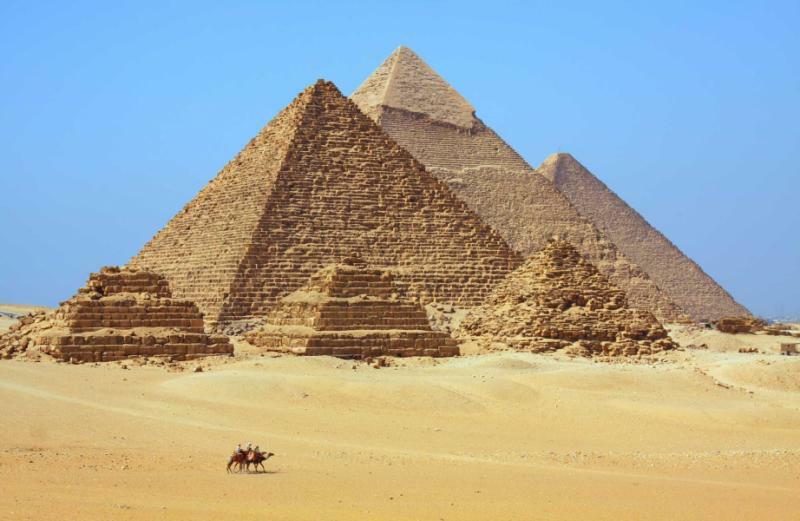 The first ancient wonder of the world, the Pyramid of Khufu, also known as the Great Pyramid of Giza, is the largest of those ever constructed. You will only begin to understand its scale once you are standing beside the slabs of white limestone, gazing up at its enormity. Khufu was considered an unruly tyrant and the pyramid he constructed has a less than salubrious history. Your specialist Egyptologist guide will narrate this history to you as you walk to the Pyramid of Khafre, which actually appears taller due to its steep walls and elevated position in the desert. Although fragments of the stepped walls are crumbling and parts of stone will come off in your hand, the preservation of these pyramids is simply remarkable. As you stand between the pyramids, the desert sky will burn a blissful blue. With few other people around, you will journey into the days of the Egyptian dynasties and truly sense the old-world grandeur of it all. Your final stop in Giza will be the Pyramid of Menkaure, which is smaller in stature but more interesting on the inside. Take a walk through the interior and savor the historical ambiance, along with the statues that stand mystically beneath the iconic facade. There are other pyramids and ancient cities amongst the sand. After you explore the remains of Memphis, you will be guided to Saqqara, the site of the first pyramid to be constructed. While it does not look anywhere near as impressive on the photos, the visible age of this endearing structure will be long remembered. Your Egyptologist guide will continue the detailed lesson, informing you of dynasties and building methods from the time of antiquity. Enjoy a meze lunch, then the afternoon will be at your leisure, with a driver at your disposal for a journey anywhere across Cairo. There is a wonderful chaos to the Egyptian Museum of Antiquities. You will find priceless treasures haphazardly piled up in galleries and stretched along the corridors like discarded toys. 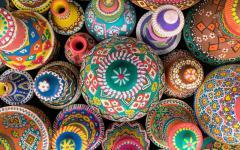 Many visitors are baffled by why such an astonishing collection of wonders is presented in such a disorderly fashion. For some, this is part of the charm. With a guide, it will be easy to make sense of the Pharaonic treasures and know where to find the most impressive artifacts. The items taken from the tomb of King Tutankhamen will be a natural starting point, followed by the golden gems and flamboyant statues pulled from different pyramids. The Egyptologist guide will tailor the discovery to your interests as they reveal all the stories that complement these invaluable artifacts. You could spend two hours or two full days in the museum and still not get close to everything on offer. The guide will customize your discovery, whether you would like to focus on a particular dynasty, just explore the highlights, or spend the full day in the museum. The rest of the day will be at your leisure, and you will have a private car and driver to take you anywhere in the city. 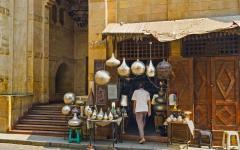 Medieval Cairo will entice all the senses. As you enter through the northern Bab al-Futuh gate, you will smell the fragrant smoke from water pipes, which hangs in the air before it drifts through ancient alleyways. Intricate calligraphy marks the lanes as you will find the exquisite details on every corner. 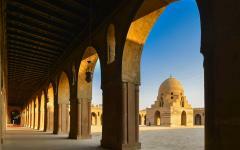 This is the heart of old-world Egypt, and it contains some of the world’s finest Islamic architecture. It will be a pleasure to explore on your walk with a local guide. Pass the splendid Al-Hakim Mosque and explore the details of the Qalawun Complex before you will follow the sounds to Khan el-Khalili Market. 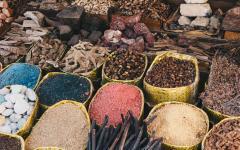 You will hear traders call as their shouts carry above rows of exotic spices and endless mounds of colorful treasures. 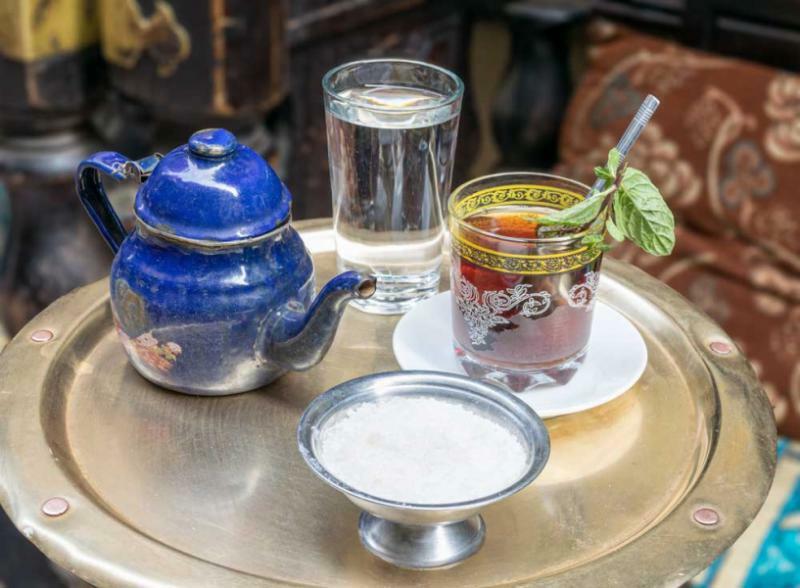 Then you will continue up Al-Azhar Street, taking a look inside Al-Azhar Mosque before you stop for a cup of sweet tea in Al-Azhar Park. 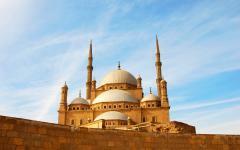 Sultan Hassan Mosque is one of the world’s largest mosques and celebrates the essence of Medieval Cairo. It is one of the few mosques in Egypt that can be visited by non-Muslims and there is a wonderful serenity to the interior, with whitewashed walls that highlight the geometric patterns on the domed ceilings. 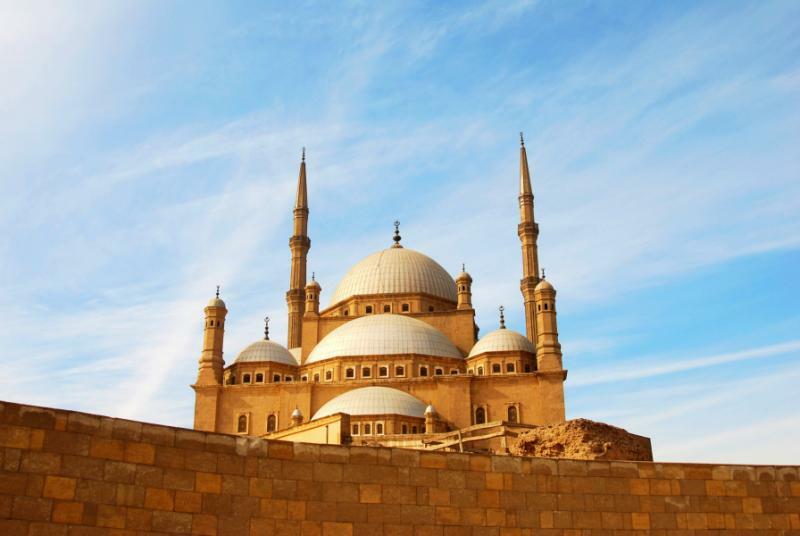 Then you will continue walking, past the burial place of Egyptian kings to the 9th-century Tulun Mosque. 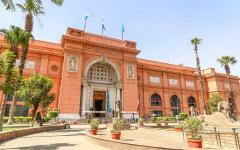 Finally, you will be guided out of this UNESCO World Heritage Site towards the Cairo Citadel. 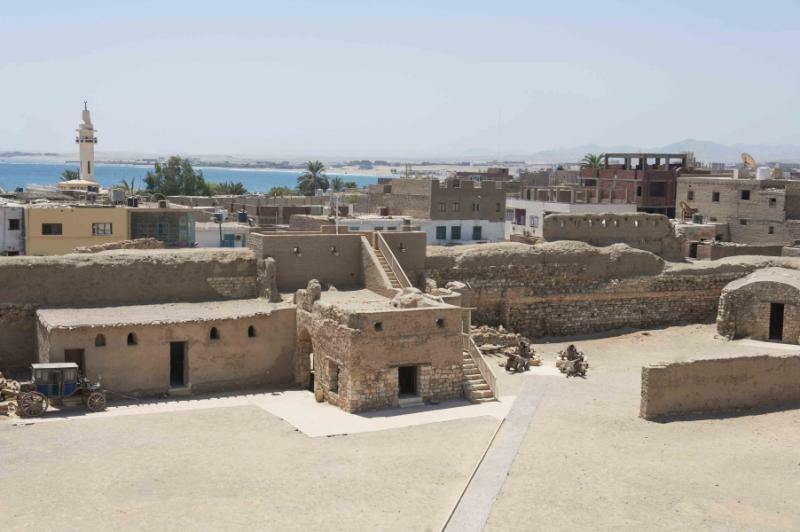 You will stop for a hearty lunch with views up at the Citadel, then spend the afternoon discovering the museums within the ancient Citadel complex. The next day, a short domestic flight will replace the colorful chaos of the capital with the unperturbed tranquility of the Red Sea. 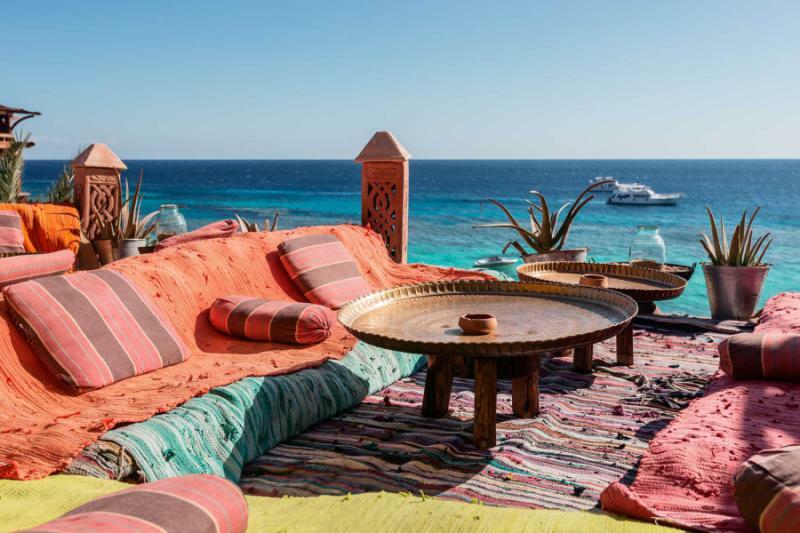 Backdropped by crumbling mountains, El Quseir is a quiet coastal oasis south of Hurghada, where the tropical colors of the Red Sea stretch out from the balcony at your coastal oasis. The sand is quiet here, a place to slumber beneath rising palms and listen to the soft sea breeze. Your five-star resort will be extremely spacious as it stands over the sand, making it entirely possible to spend the day without shoes. Mixing traditional desert style with contemporary comfort, it is an ideal place to escape to the coast while you enjoy all the modern luxuries. Private airport transfers are included, and you will have an afternoon at leisure upon arrival in El Quseir. In the morning, sand dunes will twist and turn in Wadi El Gemal, where the Sahara Desert meets the sea as it envelops an ancient waterway. There is a remarkable silence out here, and the solitude can be absolute, especially when you cross a ridge and disappear into the sand. Yet it is not just big sand dunes. Running through the national park is a wadi (river) of remarkable color, a mystical blue-green that’s more translucent than the mind can imagine. You will visit Wadi El Gemal on a full-day tour from El Quseir as there are numerous options of what to do when you get there. Walking trails will lead you along the wadi to crystal swimming pools that are framed by towering rocks. You can also journey into the dunes and take in the endless vistas of the Sahara to admire how it stretches beyond the horizon to the western coast of Africa. You will return to El Quseir while the sun set over the desert. These next three days will be all about the Red Sea and the untouched beach. You will relax on the sand as time slips slowly away. There will be no need for a watch as you settle into the rhythm of the coast. Escapist and enchanting, El Quseir is Egypt’s lesser-known coastal destination, far quieter than Sharm El Sheikh. The atmosphere is of yesteryear, and there will be nothing to break the repose, other than the temptation of Red Sea activities. 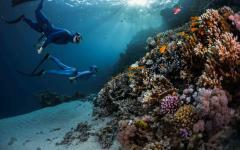 Many fabulous dive sites will be within reach. 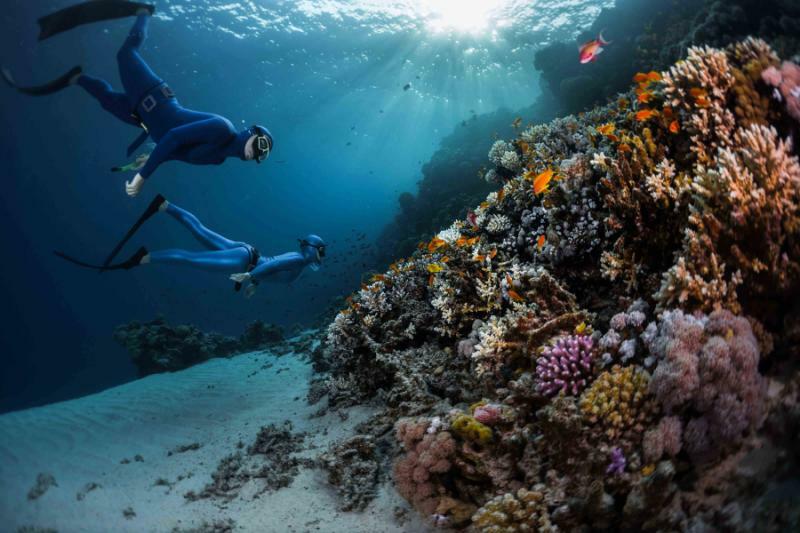 These combine the iconic impressions of the Red Sea – vibrant reefs, rare and exotic fish – with large pelagic fish and the chance to encounter the ocean’s giants, such as schools of hammerhead sharks. Snorkeling is excellent, and the sites around the resort are great for beginners, with calm waters and a chance to snorkel along the top of reef walls. 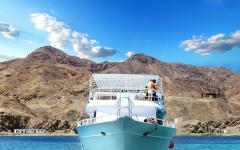 It will also be possible to take a boat trip to more adventurous snorkel sites. If you still seek to explore the desert sand, there will be a whole world of dunes within a 20-minute drive of the Radisson Blu. This final full day will take you back to the desert, into a web of roving dunes and endless adventure. As you spend the morning on a camel, indelible bands of sunlight will reflect off the sand while you follow the ancient route of the camel caravans. With a camel, you can move surprisingly fast as the metronomic steps lead you along ridges until you are completely consumed by the breathtaking spectacle of the dunes. Silence reigns. Look in any direction, and all you will see is sand. Yet no two vistas will be the same since each dune and ridge is a subtly different shape. And tomorrow, these vistas will have disappeared, the wind continually shapes the desert through minute changes. A shaded tent has been erected in the dunes, and you will stop for a pot of sweet tea or coffee, along with a traditional desert snack. Then you will continue your journey in an ATV to take an alternative and adventurous route through the dunes with flumes of sand that fly up next to the wheels as you create a virgin path across Quseir Desert. You will return to the resort around lunchtime and this final afternoon will be at your leisure. 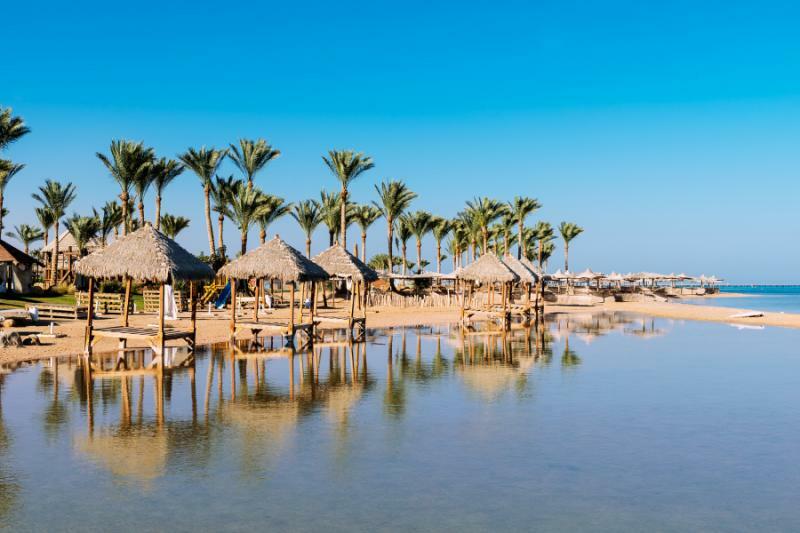 On your last day, you will wake to the Red Sea sunrise one final time as the waters glisten through a rainbow of hues that lighten up the traditional architecture of the resort. After breakfast, you will be transferred to Hurghada Airport for a short domestic flight to Cairo International, where you clear immigration and depart the country. "This Greece tour operator handles travel very well." "Santorini was the best and we really enjoyed our hotel, Volcano View"
"...the land tour was superb and the our guide Stathis made the tour extrmely interesting..."
"We plan on going back - it was one of our most enjoyable trips."